Over the past three years, TypeRacer has been a fun, even addictive, virtual world for personal development and sportive competition, visited by thousands of people every day. Although I like to think that my selection of funny and interesting texts for typing had something to do with TypeRacer’s success, the athletics of typing is really the main ingredient that keeps people coming back to the site. It’s fun to to compete against people from all over the world in typing, a vital, everyday skill, and it’s rewarding to see the improvement in your focus, stamina, and dexterity. There is also a lot of potential in TypeRacer as a medium for learning new information and I believe that a community effort to create new sections (“universes”) within typeracer.com is the way to unlock that potential. A Typeracer Universe is a distinct version of the typeracer.com website which is accessed through its own unique URL such as (http://play.typeracer.com/universe/code). It has all of the same functionality, but with a distinct set of texts and stats (the high scores will represent only the races completed in that universe). A small group of us, including David Pritts (famous for appearing in the TypeRacer walkthrough video as well as being able to comfortably type 140 wpm), and a number of school teachers, have been experimenting with this new medium since last summer. David designed two new universes: one for learning SAT vocabulary and another consisting of only the easy texts from the standard rotation (which might be a hit with our “race selectors”). Meanwhile, the teachers have been successfully using their private universes to teach their students. With this technology ready to be put to wider use, I need your help to unlock its full potential. Let’s build some new universes this year! We could have universes that teach history, science, languages, and just about anything else. At the same time, we could create universes with different themes just for fun. Please submit your ideas! subjects like history, law, biology, physics, classic literature, etc. Please tell us about any category of texts that you would enjoy typing or learning. Some universes could become powerful learning tools for various subjects while others could exist just for fun. Please submit your ideas as comments on this blog post and vote for ideas submitted by others (using the thumbs up/down buttons). If your idea is chosen, you will get a free TypeRacer Admin account, which will let you create and maintain a new TypeRacer Universe. Or, if you see an idea that you like, you could volunteer to help create that universe. Creating your own universe with an admin account is simple: just enter your new texts or choose from a list of existing texts (take a look at the screenshots). If you’re submitting an idea or an offer to help, please don’t forget to mention your typeracer.com username so we can contact you later. I would like to make a universe that has texts excluding the letter e.
Why excluding the letter e? E is the most commonly used vowel in the English.There was a book written without any of the word having the letter E,and thought it would be fun to try to do the same thing.Also a space themed universe would be cool two. Interesting. I wonder how the absence of “e” might affect typing speed. I believe you’re thinking of the book called Gadsby, which you can read in its entirety online here. Would you like to volunteer to create a universe called “gadsby” (i.e. choose quotes from that book)? Yes,I was referring to Gadsby, and I am willing to volunteer to create a universe from it:). I’d love to have snippets that point out interesting language features in java or python or even ruby that I might not know about. Another interesting option might be to collaborate with shell-fu.org to be able to type some of their most popular shell snippets. I’m not sure I have the time or skill to develop either universe myself however. Great ideas! I think the shell-fu idea might be a good one to start with. I should update the post to explain that creating a universe basically only requires entering the texts into a form. The time consuming part is finding the texts, so a shell command universe should be super easy to implement. If I get an opportunity to create a universe, I would choose quotes without vowel ‘A’. I really like the idea of SAT vocabulary. This would help me and others prepare while improving typing speed. I would like to make a universe with texts from sketches from comedy routines. Since it’s now been published, I just made the Easy Texts universe easier! I deleted a few texts that are actually not too easy, increased the frequency of the Bloke Quote appearing, and added about 10 new super easy/short quotes. Since it seems to be the most popular quote, maybe we should make “The Bloke Quote” into a universe? Just one text? 🙂 I bet we would get plenty of scores at 250wpm or more. How about purely random texts, characters only? It would be interesting to see, how fast you can type, when all your known words and frequent bi- and trigrams are taken away. Beatles universe, cause there is Beatles everything else, its a hoot. When racing with Typeracer I personally get the most satisfaction out of typing passages from works that are memorable/challenge our thinking (e.g. Way of the Peaceful Warrior/Zen and the art of Motorcycle Maintenance) or memorable quotes from historical figures (MLK/Churchill/Gandhi). This gives us a chance not only to improve our typing but learning something of value in the process – well at least in my opinion. I’d personally rather remember these types of phrases rather than learn about the thermodynamics of pizza or ninjas (I apologize if I offended anyone there). As a musician i would love to have some of my lyrics in a universe. And I bet there are regular users of this site that are poets, songwriters, maybe people who have their own unpublished novels. 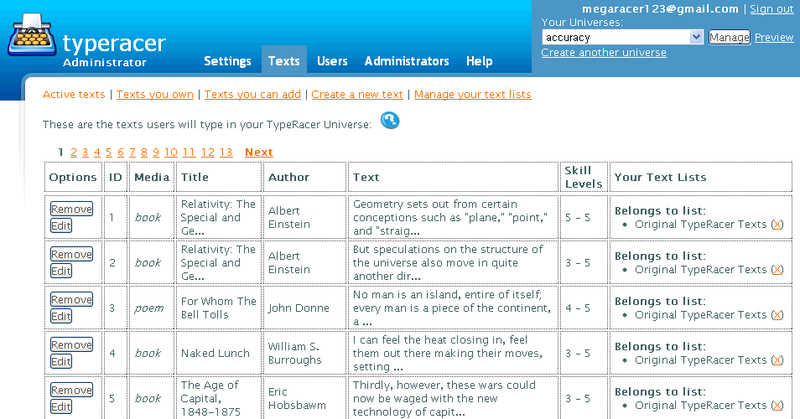 So I think the universe I would like would be made up of the creations from people who reguarly use typeracer. This is the best idea so far. Marathon texts are the second best. This would help people from computer science field to learn many things. And tongue twisters would make people a bit fluent in English language. I think it would be useful to have a universe for texts which last for 5 minutes or more. We could use existing texts but I think it would be better to introduce new ones which are easier to type and have a better flow. This would help build stamina and rhythm. Cool idea for a new TypeRacer! My Typeracer account is OhioGirl. I’d love to make one with quotes from the Bible. It was actually going to be my programming project to make a game similar to TypeRacer with passages from the Bible, but my programming class got cancelled : ( I believe it’s the Word of God, so obviously that is why it would be cool for me. But even if you don’t believe that, it is still the best-selling book ever with amazing influence and impact all over the world. It would be good for people to familiarize themselves with some of it. I’d love to do it if you’d let me. David: I’m down with that. You could have different universes for different versions… that would be awesome. Different versions would be fun, but I wouldn’t want to spread it too thin. I think the races are more fun when they are full and if we create 5 different universes for 5 different versions they wouldn’t be as populated. Although I would love different versions I think one universe would be best. I use ESV, but I think NIV is most popular around the world so that should probably be the one we use. The one reason I might want to create two universes is OT and NT. What’s your thought on that? I’d rather stick with the idea of centralizing the Bible to just a singular universe, but I also know that it’s a huge book. Some versions have very different cadences and punctuation conventions, which is why I would tend to keep them separate. I started a NKJV universe at http://play.typeracer.com/?universe=bible_nkjv – I will try to get it populated with some texts over the weekend. Hey, yeah, was actually hoping that typeracer had passages from the Bible. Really hope a Universe is created for Bible quotes. And, Thanks TehStrike for starting the nkjv universe. There’s just one passage up so far, right? I can help adding some more passages. And, if you guys are starting another universe for just NIV or ESV (or both),… am totally free! 😛 So, would be more than glad to help. I have about 50 passages up now. * is it possible to control the order of texts that people type? I think it would be cool to type complete chapters (split into many races). * The bible has been translated (very professionally) into many, many languages. bibleserver.com has lots of texts, many of them are free to use. I’d be glad to get a German bible universe, for example. These could be the same texts, just another language! Yes, it is possible to control the order of texts. HOW is it possible to control which texts you are given to race? I would like to make a universe to study scrabble as I type. That is, the texts would be lists of scrabble bingos. That would be awesome. Maybe there should be different universes for TWL and SOWPODS? If I could type lists of high probability 7 or 8 letter words, it would be a double whammy for me, since I’d get to practice typing while reviewing for Scrabble. BTW, is there any way for me to make my own lists to type from on the typeracer interface? Or can this only be done by creating a new universe? Thanks. Okay, Gabriel. E-mail me at sean dot wrona at gmail dot com, ’cause I don’t know how to contact you otherwise. I’d also like to see a Drill Universe. In almost every sport you practice with game like scenarios and scrimmages, but you also practice with drills. Same thing with TypeRacer. Racing gets you faster. But working on the basics really improves your typing a lot. This really would be the ultimate typing site if this was a Universe as well. http://www.davis.k12.ut.us/cjh/appliedtech/business/keyboarding/ This site has some good drills if you are wondering what I’m talking about. I’m sure not everyone would call them drills. If you think this is a good idea as well, I’d be up for making it happen. I think that this is a wonderful idea! Also, that it will be easier for other type racers. Hey Sean, it will be pretty easy for me to put quotes from other universes into the main rotation. Six hundred is not enough, I agree, and that’s part of the reason I want people to create their own universes – to share the burden of entering new texts. About the skill levels – texts are roughly segmented by length, depending on skill level (the idea is to not make a beginner have to type one quote for 5 minutes). That’s kind of like my last suggestion. I think it would be cool if there was a Net Speed universe which would normal texts, but each time you made a mistake, it would subtract, lets say, 1 word off the total amount of words. e.g. if there were 100 words in a text and you finish it in 1 minute and you made 10 mistakes, you would subtract 10 from the 100 giving you 90, so the Net Speed universe would say that you typed 90 words in 1 minute, giving you a net speed of 90 WPM, instead of the original (gross) speed of 100 WPM. As much as I like the Accuracy universe, I think this one would also be cool, because you won’t be kicked out every time you make a mistake, but it will encourage people to improve their accuracy. So where can I find universes available? There are no links on the main page. Up until now, only the ones mentioned in this blog were available. Since people are now volunteering to set up new universes, I think we’ll have a directory of new universes set up in the near future. very beneficial for both improving typing as well as General Knowledge. Hope And Wish We get Best from Typeracer. Thanks TehShrike for the ‘NKJV’ universe. P.S. : Even mathematical quotes universe will too be great fun to perform races on. Thus, in the language of this chapter, Gaussian reduction works by eliminating linear dependences [sic] among rows, leaving the span unchanged, until no nontrivial linear relationships remain (among the nonzero rows). That is, Gauss’ method produces a basis for the row space. I love all the ideas that were posted in the example topics (Like programming languages, the subjects from law, physics etc.) I’m taking a programming course in high school this upcoming semester and would love to practice here. But I’m interested in all those, unfortunately I don’t have enough information to make those universes or the time currently. Thank you though for letting me use type racer, one of the things I have to do in my programming class is type very fast (I think the requirement is 110 words a minute) so thank you for letting me practice and have fun. I consider typing to be an important skill for a programmer. That said, I found much humor in the fact that I did so well on the texts in the code universe 😛 apparently all that coding on my ultimate das keyboard leveled me up at hitting the curly-braces and parentheses on the fly. Also, 110wpm is a pretty ridiculous requirement for a coder. Nobody else where I work types that quickly, and there are some fantastically smart coders there. How about a universe that has minigames that don’t make you type texts but randomized words, but with a twist. In particular I was thinking of displaying names of colors in different colors and the typists given commands as to which to type out – the color displayed or the word. (Like the word red displayed in the color blue) A bit of a test in reaction time and thinking speed I suppose. Please, How Can I Send My Own Universes? By The Way, I Suggest Some Other Universes Like A Punk Rock Universe with song lyrics of that musical genre —maybe a lot of sub-universes here: for example, one dedicated to The Ramones. And How About A Strange TypeRacer Universe In Which He or She Who Wins Is The Typist With The Greatest Number Of Typos —No Matter That Someone Else Has Arrived First To The Finish Line. Would You Like The Idea Of Another New Universe Which Is The REVERSED Version Of The Normal One? Thank You Very Much From Mexico City. I know a bloke who knows a bloke who knows a bloke. Now, I know you know this bloke. This is a bloke you know. My name is Athos and I started on typeracer on the orkut. Was a time that Alex the owner added me on orkut and sended me a arthicle aboout a disese related reppetitive effort. I want to be a volunteer. I can help you about anything about the universe of Portuguese (br) Language. We have here a lot of player who plays portuguese. But we have two basics problems. – Portuguese of Portugal is a little bit different of portuguese (BR). – The Automatic translation is a problem too. I can help in this universe, real texts on portuguese and I love the book The Servant and I can add some great texts from this book that we can learn a lot of things about essence of leadership. I want and I hope that I can help this lovely game. *continued* and in addition some F1 type chicanes which are nothing but easy easy part of the sentence which goes on for a few minutes and where speeds can be maximum. Along with this in the 20 minute typing period there will be 2 pit stop provision, where the typer can press the enter key at any point in the race(only 2 times) to pause it for 2 minutes. This universe will be the ultimate in taking typing ever so close to real racing. My typeracer username is godknowswhy. I would love to create a universe that only snippets on how to type better. Also another one that I would love to start is one that only does quotes about how to speed read (i.e. speed reading for dummies). I have always thought speed reading and typing go hand in hand. A final idea is to get quotes only from a popular quote website (i.e. http://www.goodreads.com/quotes). Special characters slow down a typist. How about a universe with only special characters and no alphabets? And how about a universe with only ASCII art (like the one that follows)? Additional i would suggest an “cursor” that follows the text, that i have already written, if you wish i would write an prototype that can do that.. I love this! I have been at Typeracer for a couple of years already, enjoying the experience throughout. However, the one thing that has hindered my improvement in typing is that after several races I begin to mess more with speed while losing on accuracy.As a result I have not yet been able to establish a regular speed of 70+ yet. The introduction of this feature is gonna make me more patient and hopefully will improve overall in the day-to-day typing.Thanks! I have a friend who already told me once, months ago, he would like to help including new portuguese texts, to correct the ones wich already exists and that kind of thing. I’m gonna help him too, of course, he has a job with programming, a good thing in this case. Can we can do that? The “galaxy_typewriter_rhombus4.jpg” image is a slightly SUBLIMINAL one. Could you include something for users to report typos and mis-spellings? After playing through some of the universes I have noticed a number of spelling and sentence errors. This would be very useful. Thanks for the suggestion. We need a universe without any punctuation except a period at the end of a race. This may not be correct, but it may help some with speed. Thanks. I’d like to do one on dogs. I’m thinking of general quotes from Wikipedia on the different breeds of dogs, but I could do other sub-subjects like obedience training tips from famous trainers or general care tips or whatever if the community wanted something other than dog breeds. I would also like to suggest that we make a “Long text universe” where there are extra long texts that keep fast typists busy for at least a few minutes. Because I find that the races don’t last too long. Expanding vocabulary knowledge is paramount to life’s success. Typing out new words and example sentences unequivocally ameliorates such knowledge. SAT is a good start but GRE contains advanced graduate-level vocabulary. I would like to create a GRE universe. I’m just so happy that I’ve found this website. It’s so easy to learn with the TypeRacer. If anyone of you wants to learn geography in a fast way, I recommend: ilike2learn.com – another amazing tool to learn. Maybe some criteria based on text length or appearing characters and you have interesting texts every day! Good suggestion! I was thinking the same thing not too long ago. Let’s see how many votes we get on this idea. What is the process to build my own universes? I think we should have a universe where when you make a mistake, you can go on without correcting. You will be able to correct, but you don’t have to. I would call it “Raw Speed” Some one has already suggested how to grade it. We should make ‘instant death’ a sub-universe of all universes. what is the secret code for the numbers universe? Thank you. I don’t want MY ideas to pass the hateful thumbs up / thumbs down process. 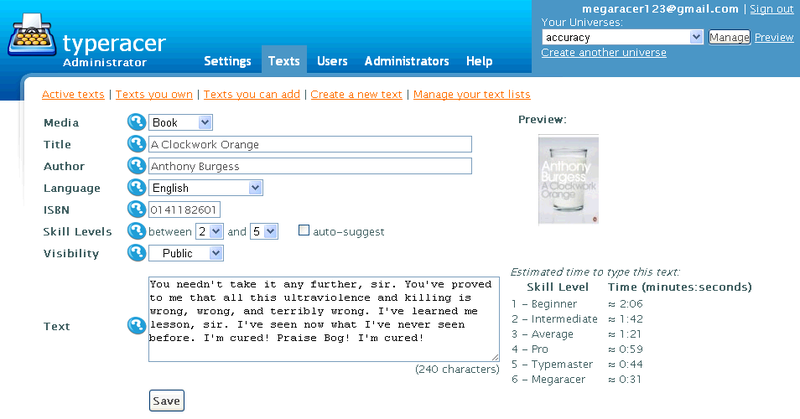 I already have some new and useful universes in my mind but I prefer to send them through email to this website owner. I suggest that every TypeRacer Universe —or sub-universe— must count our participation, our statistics, From ZERO —because it’s very possible to be faster in certain TypeRacer versions and MAYBE this would be a PROOF that some Megaracers are rapid typists mainly in short text situations. For example, here’s an old idea of mine: How about to create a monthly TypeRacer multi-level Marathon in which slow and fast competitors participate with a LONG succession of texts; all is measured in this Marathon: accuracy percentage, total number of typos, and speed. Perhaps there are sluggish typists with a high endurance level and fast ones with a low endurance level —who knows? And this is also another old idea of mine: Why not include a TypeRacer functionality in the normal version —the Typeracer original Universe— which permits every one of us to REPEAT any competition text the times we want to in order to DOMINATE it. Of course I LIKE the idea ( by valikor ) to turn the “bloke quote” into a single universe —MAYBE All The Competition Texts From The Normal TypeRacer Might Be Converted Into Individual Universes, each of them with its own statistics. Actually Jesús, all of the universes have their own separate stats by default anyway. Yes, there is a secret code for the Numbers Universe. I am trying to disable that but seem unable to do so. I think that a drill universe is a really good idea, but it would need a new anti-cheat mechanism. I propose a universe made of very complex and quaint literature quotes. See and learn strange vocabulary, complex grammatical structure, far out metaphors and symbolic language. My wish would be for it to be challenging to and yet beneficial for the brain. (and a little bit trippy.) Get some juice into our speech! My typeracer name is boomfist. I would Like to maintain an Universe for My University (Central University, Bilaspur (india)). so, that I can Organize Some Competitions like The Ultimate Typing Championship in our University and Encourage them to Increase their Typing Skills, In this Universe I’ll be Maintaining the Quotes Provided By the Students and Teachers of this University. I’m a frequent user of Typeracer (nearly 22,000) races so far for me. I assure you I’d be managing my Universe With great enthusiasm. Hope and wish to get a Favorable reply from your side. I have an interesting idea, how about a left hand universe and a right hand universe where you only use one hand for the entire test (backspace is the exception). But I think it would be pretty cool to trains your hands individually if you think you’re having a problem with one. Hello, I realize I’m a little bit late. I would love to manage a universe with a heavy emphasis on numbers. Every text would have numbers, and a lot of them, but would also be mixed with letters as to discourage your hands from leaving the homerow completely. Another universe I would be happy to manage would be a homerow universe. There may be need for multiple universes because of different keyboards, but I would be more than willing to run both a Qwerty and a Dvorak homerow universe. Hello again, I hate triple posting but I would not like to put all my thoughts into one post, as in the case I did get voted, whick idea wins? I’ve noticed that no one has volunteered to improve the French universe. French is my second language and I’d be willing to improve the current translations and submit new texts that are natively French. What about “universe” without any character? Is that possible? COME ON PEOPLE!!! What’re you talking about. One wants to type texts without letter “e”, the second one wants to type text without special characters… Damn! I think it would be a hit. i would like to create a universe to help Certified Administrative Professionals (CAP certification) prepare for their certification using excepts from the study materials & flashcards. I’d like to correct the (awful google-translated) german texts and add new ones in this language. I live in Germany and speak German as mother tongue, so I’m sure with grammar and spelling. I’m a spanish guy that sometimes plays at this website. It’s nice to know that it’s possible to compete in my mother tongue. However, the translations from english to spanish are poor and wrong (what makes me sometimes to get muddled), and there are very few texts and it’s becoming extremely repetitive. As far as I Know this is one of the reasons why so many people from ‘Spanish’ countries are not anymore interested on this website. They are not familiar with English and they prefer Spanish but when they switch they get a bit disappointed.. I would like to create a universe containing text from common HTML code, including syntax, tags, attributes, etc. I have about 4 years of experience with HTML, so I can write/read it fluently. Is it possible to bind spacebar keyclick to raceagain link click? I live in Germany (German is my mother tongue, so I am sure with grammar and spelling the language) and would like to start an universe with German texts starting with correcting the now available (awful) google-translated ones and then trying to get/write easy texts for learning the language as well as texts from “normal” books. (Asking the publishers for their agreement) It would be great getting an account for this! I would like to race against a premium member. Can anyone out there please help me with this? Congrats ChimChim (SS) for achieving 50,000 wins–far more than any other player on Typeracer! I think it would be awesome to have a universe of quotes that are easy to type on the iPad. (all lowercase no punctuation etc) I have an iPad and let me say I am on that thing all the time! If that can be created, you could make an app, and make it accessible to the people on iPhones/iPods too. I am a big texter and I would love to do a testing race! It’s crazy how far an iPad universe would take you! SO many opportunities for expansion. There needs to be more variants of the code universe. Some people are comfortable in C, some C++, some Java, some C#, some Perl, some Python, some Ruby. The list goes on and on. There should be code universes separated on a language by language basis. Furthermore, the individual code universes should respect formatting of elements. Thus, newlines and tabs/spaces should be rendered in the text-to-type, and it should be a requirement to follow the formatted structure. Great idea! I’ve been always annoyed by somewhat strange machine-translated Japanese sentences. There is a site, named “Aozora-bunko,” (meaning “Blue-sky Library”) collecting copyright-free sentences written by Japanese novelists.(http://www.aozora.gr.jp/). We can quote easily many “real” Japanese sentences from there, because the sentences are available as text files! # Some of them are written in old style Japanese, however many sentences are written in today’s Japanese. The Instant Death Mode is a good tool to practise accuracy, but I suppose it would be much nicer that users have to retype the passage once they’ve made a mistake rather than instantly being kicked out. It takes quite an amount of time to restart a race. I think Typeracer should have a Shakespeare quotes’ universe. Does anyone know if my account will be automatically be deleted if I don’t check my email to complete the registration to my new account for 1 month ? Will my account be deleted automatically ? A different version of the normal universe with all the competition texts spoken —this project would need native american english speakers and in some cases native british english speakers too in order to give voice to the entire compilation of book-, movie-, and song-excerpts. In this new TypeRacer edition we would compete by transcribing the audio into text. I want a universe that’s full of furry animals. I’d like to propose a universe for learning music. It would incorporate theory books, and perhaps various lessons for different instruments. How about a universe where the words come out through audio and you have to type it? Username is SnapMaster45. How about a Type Racer for Dvorak typists? Not that anyone would actually, technically know people were typing on Dvorak but it might be a fun thing for Dvorak typists like myself. I would like to make a universe with only numbers. I remember reading somewhere that if you have a visual and auditory response when making typing mistakes that your accuracy increases at a greater rate. Is it possible to put in an error sound? that users can choose to turn on if they want. I could put together a decent-sized linguistics Universe. I’d also like to see (though it wouldn’t be something I could do myself) a Czech-language Universe. Hi, I’ve been on typeracer for quite a long time and I must admit, Its damn addicting!!! And, compound it with the fact that my typing speed is now increased to 71wpm from 35wpm, you can just say one word about typeracer – wow ! Just one question though, Why isn’t typeracer available on facebook? Its says “temporary not available” on its facebook app and its showing the same error since so many days it seems this temporary is soon becoming “permanent”…. I think a Law School/Bar Exam Universe would be very useful. Since everyone types on these timed essay writing tests, typically the faster typists have an advantage. I have found that typing the black letter law over and over is the best way for me to memorize it. Further, it needs to leave your brain though your fingers onto the keyboard anyways. Would like to see/make a wisdom or enlightenment universe. Most of the quotes on Typeracer are already a very wise selection of enlightening quotes. Kudos to the one who selected them. I would like to add to the volume of “wisdom” quotes. And maybe have a universe that uses quotes from various religious/sacred texts like the Tao Te Ching, Holy Bible, Baghavad Gita and Qur’an. This website is mainly to train people and help them be a better typer, my self I have been training type for many years but, I have only recently joined this website and I am loving it. All parents should encourage their kids or do it themselfs to feel the fun with playing with other people! Being a Computer Science Major, and being required to take Biology (not just a general science) is a major drag. I think an Introductory Biology universe would really help me out, as well as many of my fellow students. The course is entirely memorization, which is what typeracer is excellent for. i think there should be a universe with no capital letters or puncuation. Hi, this post has been here for some time, did any of the suggested universes get created? I’d be happy to create one – like you suggested – with legal texts taken from prominent law cases. I know lots of law students already use typeracer, and I am sure many more would do so if the quotes could be more specific. It would not be difficult to find a few hundred quotes to start things off. I want to create a universe for Spelling Bee Vocabulary. This not only improves typing but it also helps me inprove my vocabulary skills. How do we do a quote from our fav book? the song itself is fairly simple and pretty repetitive, I think it would be at home here on typeracer in either the general universe and/or the long texts universe aside from my proposed “lyrics only” universe too. Hi Matt. Thanks for your comment. I am putting down your name/email on a list of people who might like to volunteer to help in the future. When we get to a point where we are working on some of those universes (such as the Bible universe) I will shoot you an email. In the meantime, please think about how you’d like to improve it. I know this is an old post, but I couldn’t find a place to submit new universe ideas. How about a universe full of quotes from the fortune program? I think it would be cool to create a Typeracer universe dedicated to historical quotes, such as quotes from Albert Einstein, Thomas Edison, Marie Curie, sports legends, and so on. I believe that many other people would enjoy this, and I would be willing to maintain this universe and keep it updated, add some quotes every once in a while and such. I would really appreciate the opportunity to create a universe that has snippets of code commonly found in programming contests (typically in Java or C++). I run the programming team at my school, and we are planning to get together on a weekly basis in order to practice typing faster (which can often be a crucial factor when trying to finish contests problems quickly). Typeracer provides an excellent platform for this, and I would love to be able to provide the members of my team with a specific universe relevant to the code excerpts we often see in contests. Feel free to contact Support if you’d be interested in submitting new quotes – we can discuss if and how to do this. I would like to create a universe that is similar to the Code universe but it will only be specific to the laravel framework. In my opinion the universe will be benefic for everyone interested in this popular framework and PHP language. The Code universe is good but i think is better to train in the coding style of our work/projects specific language. I noticed that there was the word “space” in the comments here, so I thought, why not create a typing universe full of quotes about space? This universe would be rather fun; typing quotes about space! It could also help people who are skeptical about space, or students of astronomy.